I had intended to break my (relatively) long silence with a piece on the pitfalls of confusing research infrastructure with big science. 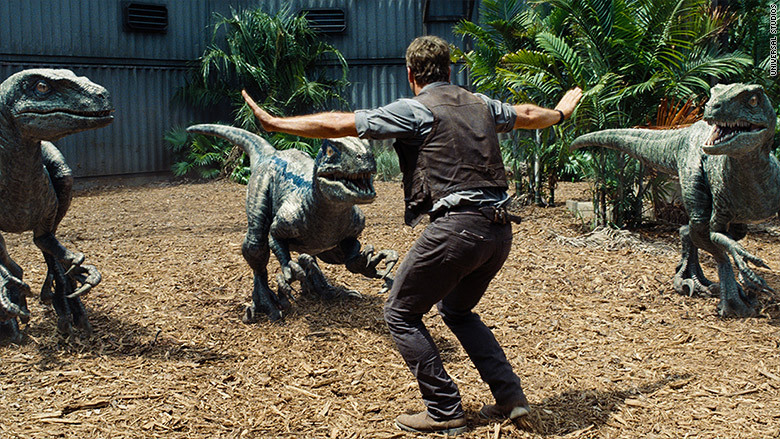 But instead, I’ve ended up writing about Jurassic World. Go figure. I’ll put my cards on the table straight away; I didn’t have high hopes for this movie and my instincts were right. Despite the relentless noise, roaring, shouting, running, etc., I actually dozed off about halfway through. Colin Trevorrow may be a highly competent director, but he’s no Steven Spielberg. Which is a pity, because there was at least the kernel of a good film here. The idea of a world where genetically de-extincted dinosaurs are so commonplace that you have to engineer fake ones to meet the public’s demand for new thrills is an interesting one, and also quite meta given that this is exactly what the Jurassic Park movie franchise felt it had to do to drum up an audience. The massive figures for the opening weekend suggest that it’s a winning formula. Look beyond this, and there are some more worrying things that emerge. Others have written more eloquently than I can about the clumsy misogyny represented by the portrayal of the main female character as a career driven ice-queen who can’t relate to kids and needs to be humanized by exposure to a real man. Knowing my daughter and her friends were watching made me feel a bit queasy about the message being conveyed; yeah, a woman can have an important job, but real fulfillment will only come when she gets herself a man and a family. Clare Dearing is certainly no Ellie Sattler, but then there’s no Ellie Sattler in Jurassic World against which to measure her, and precious few scientists of any description. In the previous Jurassic Park movies, the scientists were the heroes. In this one, we have an ex-military dog-whisperer, which says a lot about where we’ve gone since the last JP movie came out, in July of 2001. Yes, we still boo the military-industrial complex – represented by Vincent D’Onofrio’s character – but now we want our leading men to come with the approved stamp of heroism that only Serving Your Country can bring. Owen Grady may talk a lot about Alphas and pack structure, but this is animal behavior reduced to the level of understanding of the guy that teaches obedience classes for your dog. In Jurassic World, “science” is represented by the geneticist, Henry Wu; a character far more reptilian than the things he cooks up in his lab. Wu is not so much villainous as completely lacking a conscience; in one of the better moments of the film, he is asked why he has created the monstrous creature that is running amok in the park. “Because that’s what you wanted,” he says, or words to that effect. More teeth. Cooler. The fact that it is also lethally dangerous is not Wu’s problem. And that, in a nutshell, is the message of Jurassic World. Science generates a genetically modified organism and releases it into the world with no concern for the troubles it may cause; deciding whether such a thing is right or wrong is not what scientists do. It’s left to an ordinary guy who understands, in a vague, gut-driven sense, that animals are sentient beings and not “assets” (to use the Park’s terminology) to save the day for humanity. This is a far cry from the original Michael Crichton novel, which argued that only scientific theory can critique and predict the perils and pitfalls of turning reconstructed dinosaurs into tourist attractions. My colleagues in museums around the country are looking forward to cashing in on a new wave of dinosaur popularity, and for this I guess we have to show some gratitude to Jurassic World. But the overwhelming message that the movie leaves you with is that science is a dangerously amoral pursuit that is no substitute for a good old boy on a motorcycle who can relate to “raptors.” Given thelevels of public skepticism about the motives of scientists, I’m not sure this is something we should be embracing. In the New York Times this morning, John Schwartz reports that a group of prominent scientists are calling for museums of science and natural history to “cut all ties” with fossil fuel companies and philanthropists like the Koch brothers. He also quotes my opinion as to why this might be a bad thing, and very nicely refers to me as a "prominent" blogger. Since I've been a little quiet of late (grant proposals, editing a book, blah, blah, blah - all the usual excuses) I figured this might be a good time to provide a little background as to why I find myself in the unlikely position of defending David Koch. Let's get the obvious stuff out of the way first. There's an overwhelming weight of evidence that supports the theory that global warming is real and that human activities are contributing significantly to this. This position is supported by the vast majority of the scientific community, and I agree with it too. Obviously there are many people in politics and industry that don't agree with this. Because the weight of evidence is so conclusive, one of the few routes they have available to them is to challenge the integrity of the scientific process. This is what some people in Congress are trying to do at the moment, by critiquing the process of peer review. Climate change deniers (for want of a better term) like to argue that the scientific community is not neutral - that it is an advocate for the theory of anthropogenic climate change and that scientists have slanted the peer review process to ensure that anyone who supports a different model for climate cannot get funded or published. For anyone that knows scientists, or works in science, the idea that they could actually create and maintain a conspiracy of this sort is laughable - it's hard to find a more fractious, less-organized group of people. Nonetheless, the idea of a conspiracy has a lot of traction in the mind of the public. Museums have many different roles in science - as research institutions in their own right; as sources of data for other people's research; and as vehicles for bringing science to the public. Museums play an important role in explaining the science of climate change and the implications of what we're discovering for people's life and well-being. All of the survey data that we have seems to show that the public really values museums as authoritative and accurate sources of information (see here for an example). They trust us in a way that they don't trust "scientists," even though many of us are scientists and our collections are one of the many resources used to model the effects of climate change. If we shift our position from education to outright advocacy, then we risk damaging that trust. There is a world of difference between educating people about the effects of climate change versus telling them not to buy products from company X because it's causing climate change. Once we start doing that, we lay ourselves open to the charge that we are no better than the climate change deniers - that we are just pushing our own agenda. "to serve Yale University by advancing our understanding of earth’s history through geological, biological, and anthropological research, and by communicating the results of this research to the widest possible audience through publication, exhibition, and educational programs." "To discover, interpret, and disseminate—through scientific research and education—knowledge about human cultures, the natural world, and the universe." These are pretty typical mission statements for a natural history museum and you'll note that neither says anything about fighting to defend the natural world or campaigning against the fossil fuel industry. There are other organizations that do have that in their missions, but by and large museums do not. Museums need money to perform their mission of research and education, and for that they need donors and investments. Board members are responsible for helping museums realize that mission, through advice on finance and investments, by soliciting support from donors, and by providing support themselves. If you, as a board member, were to do something that interfered with the museum's pursuit of that mission - such as actively lobbying for reductions in funding for science education, or for research in museums - then that would be a problem that would likely result in your being asked to leave the Board. So if anything, being a board member might actually tie your hands. "an underlying message of exhibits in the David H. Koch Hall of Human Origins at the Smithsonian National Museum of Natural History is that humans 'evolved in response to a changing world.' The article said that such language suggests that climate change has been a feature of the planet since prehistoric times, which plays down human contributions to climate change." "We should.... be very wary of steps intended to instrumentalize our endowment in ways that would appear to position the University as a political actor rather than an academic institution. Conceiving of the endowment not as an economic resource, but as a tool to inject the University into the political process or as a lever to exert economic pressure for social purposes, can entail serious risks to the independence of the academic enterprise. The endowment is a resource, not an instrument to impel social or political change." From her lips to my blog. Museums are not responsible for campaigning to protect the natural world; they are responsible for generating and supporting the science that underpins those efforts and for educating the public about both the science and what it means for them, their communities, and the planet. When they shift into the role of advocacy - disinvesting from this industry, turning down that donation, or removing those board members - they risk damaging their ability to fulfill that mission and enabling others to argue that the information they provide is partisan and not to be trusted.